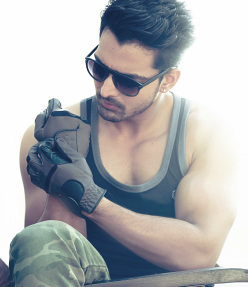 Rajahmundry born and Gwalior raised, Harshvardhan Rane who was recently rated #17 in hyderabad's '25 most desirable men by Times of India', is just 6 ﻿films﻿ old but has already made a name for himself in the Telugu Film Industry. After delivering successful movies like 'Takita Takita', 'Avunu' 'Prema Ishq Kaadhal' and 'Maaya', he is currently shooting for his Bollywood debut film under John Abraham productions titled, 'Satra ko shaadi hai'. Meanwhile his new telugu film, 'Avunu Part 2' is ready for release in Hyderabad. He started his career as Rummy Gaur in a popular hindi television soap 'Left Right Left' co-starring Rajeev Khandelwal in Mumbai. Harsha graduated from the Barry John Acting Studio and has performed in many theatrical ventures including the Indian adaptation of Tennessee Williams, 'A Streetcar Named Desire' and others by Hyderabad based theatre groups. He got his first break in Tollywood as Sri, in Bhoomika Chawla's debut production venture 'Thakita Thakita'. Multi-talented actor, Harshvardhan then created quite a buzz with his performance in 'Prema Ishq Kaadhal' and 'Maaya'. He is also one of the few actors who gets to dub for himself in his films. His telugu film 'AVUNU', directed by Ravi Babu went on to become one of the top grossers in its genre, for the year 2012. Filmmaker Mahesh Bhatt has announced that he will be producing the remake of his recent telugu release 'Maaya' in Hindi as 'Murder 4'. Harsha has also produced and acted in the short film 'Infinity', which premiered in Asia’s largest short film club SHAMIANA and has received critical acclaim for his honest effort.